When a typical mechanical switch is switched, the contacts can take up to 25 milliseconds to settle down. The result is switch bounce noise. Electronics engineers have come up with many successful schemes to overcome the switch bounce problem. However, when one has to deal with a large number of switching circuits, such as those in control consoles and test sets, cross-talk between circuits is another problem. As the switch is opened or closed, glitches can be coupled over to neighboring circuits. It is much better to get rid of the noise glitches at the source before they cause problems. By using a filter such as that one shown in Figure 1 near the switch, the switching noise and cross-talk can be eliminated. Figure 1: This switch debounce filter clips the switching voltage and slows down the rise and fall times of the switching signal to eliminate cross-talk. In a typical switching circuit, a pull up or pull down resistor is connected to the wiper of the switch. In our case, a 20K-ohm resistor is connected between the switch wiper and –24V. The logic input circuit used in our test equipment is the Systran DID48 logic input module. This module has an input debounce, but it cannot filter out the switching noise from switches mounted at 10 feet away. Our approach to fix the problem is to install the Q-501-300 Switch Debounce Filter close to the switches. The DID48 can accept input signal levels of + and – 32 volts. The logic “1” is defined as +2.0V to +32V, and logic “0” is defined as –32V to +0.8V. The power supply used in our equipment is +/- 24 volts. Since the input doesn’t need the full swing of the power supply, the input voltage can be clamped down with 5-volt zener diodes, VR1 and VR2 plus the corresponding blocking diodes CR2 and CR3. This combination has an inherent AC noise rejection because of the low dynamic resistance in the zener and blocking diodes. 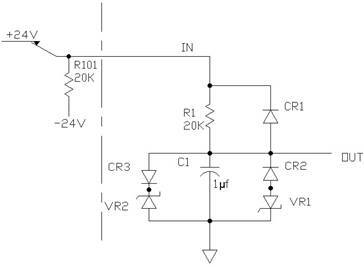 CR1 is used to bypass the resistor R1 when the switch is switched to “0” so to allow the capacitor C1 to discharge through the external 20 K-ohm resistor, R101. The capacitor C1 and resistor R1 form a filter that sets the rise and fall times to around 20 milliseconds. By slowing down the rise and fall times, the switching signals can no longer couple over to the neighboring circuits. Typically, the capacitance between wires in an unshielded cable is typically 13 picofarads/ft, which is not capacitance enough for cross-talk for signals with 20 ms rise and fall times. Figure 2. By using surface mounted components, a 60-channel switch debounce filter can be fitted onto this PWB this is 6” X 15.75”. Figure 2 shows a 60-circuit switch debounce filter that is assembled on a four-layer printed wiring board (PWB) with surface mount components and ribbon cable connectors. The cable used between the switch and the input logic circuits is a 10-foot ribbon cable with no shielding. By using this filter, we were able to eliminate the switching noise and cross-talk problems.